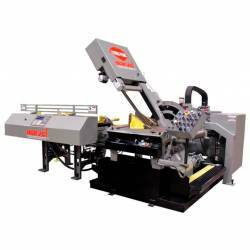 Sawing is a process that is used to cut raw material into the desired size. At AH Stock Manufacturing, we have a state of the art Marvel bandsaws that allow us to have the capacity to cut 20” x 24” and 60 degrees in both directions. At AH Stock Manufacturing Corp., we offer our customers a solution to all of their manufacturing needs, from engineering to finished products. In addition our saws have the ability for mitering in both directions and a standard 3˚ canted column for maximum versatility and high production cutting. Our bandsaws combine an electric blade drive with sensor less vector control, full stroke hydraulic vising, and a 24" index table with electronic measuring for increased accuracy and minimal cycle times.